The amount is much higher than the set target of 60,000 USD. It includes the amount donated by Standard Chartered which is equivalent to the sum raised from the community. All of the proceeds will be used to fund eye care projects in countries and territories where Standard Chartered is operating, including Vietnam. 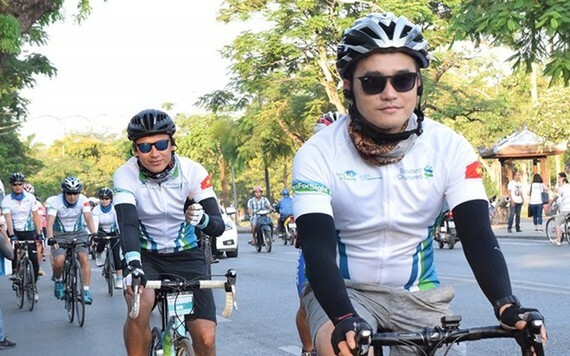 From the former imperial city of Hue, 27 staff members of Standard Chartered in Vietnam, ASEAN and South Asian countries rode across Hai Van Pass and Hoi An ancient city before reaching central Da Nang city. “Light is belief” is a cooperation programme between Standard Chartered, International Agency for the Prevention of Blindness (IAPB) and leading eye care organizations in the world. Since its establishment in 2003, the programme has supported 163.5 million people through medical intervention, eye-screening tests and instruction on eye care measures. It has also provided training courses on eye care for 294,500 medical workers, carried out 167 projects in 37 countries and presented 1 million glasses to people with eye-related problems. In Vietnam, Standard Chartered has actively coordinated with partners to support and develop eyesight rehabilitation and eye care programmes. To date, “Light is belief” has provided eye-screening tests for 2.5 million people, performed 47,000 eye operations and presented 34,6000 glasses to targeted people. Under the programme, three projects are being implemented with total fund of 2.4 million USD, expected to benefit 2.2 million people, including workers in central Da Nang city and Quang Ngai province, students in Da Nang city, Hai Duong and Tien Giang provinces, and children and elderly people in Can Tho city and Ca Mau province.